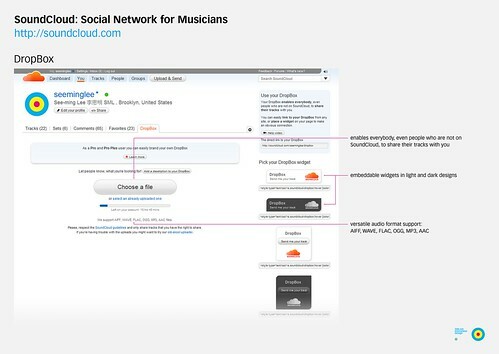 SoundCloud is a social network startup for musicians based in Berlin. Originally from Stockholm, the founders created the site after they have grown "tired of getting emails with YouSentIt links or FTP log-ins just to be able to check out [their] friends latest soon-to-be released tracks." Just a couple of years ago, when you mention music and social networks, the first site that came to mind is MySpace. Yes, MySpace is a social network and they do put much weight on music and musicians, but MySpace fails to innovate beyond implementing comments + music player, and that is barely social. In this blog post I will go through the many innovations SoundCloud brought to the music scene and explain why I like it so much. Commenting is the backbone of every social network, but what SoundCloud provides which no one else did was time-based commenting. Each track on SoundCloud is displayed as a waveform, so you can visually see how the music looks like. You can leave a comment to the entire track, but most useful is to get feedback on a specific time segment on the track. Best of all, the UI automatically displays those comments when the playhead hits the time code, which is uber cool. A really useful feature on SoundCloud is the ability to play all the tracks from people you follow. 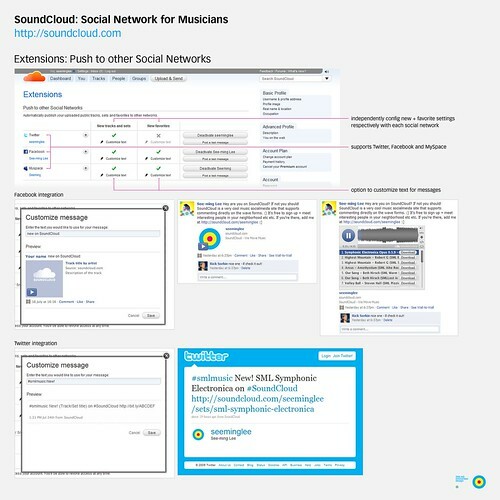 Most social networks for musicians tend to treat the musician as a social media object, and if you want to hear what's new, you need to browse the musician's page to hear his/her new songs. 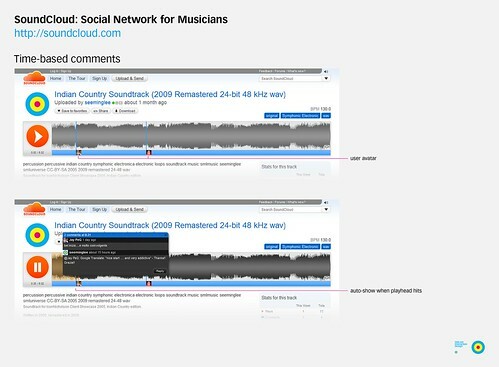 SoundCloud, on the other hand, treats each track as a social media object, and places all the tracks on the same page. Best of all, whenever you are on a page with multiple tracks, hitting the play button will play all the tracks on the same page one after another. Want to be forever entertained by great original music? Sign up an account, follow a bunch of people you like and voila! 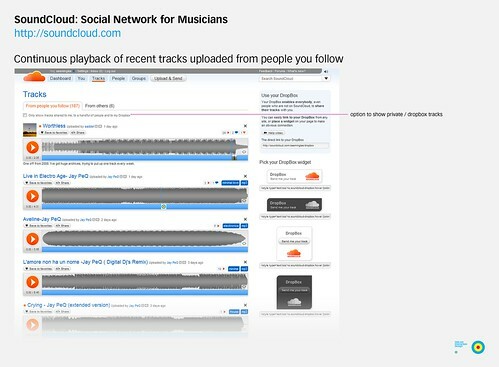 SoundCloud has tight integration with other social networks. It currently supports integration with Twitter, Facebook and MySpace. You can independently customize the message you want to send to push to the different networks, with the option to select whether or not to publish your own tracks and favorites. I push new tracks to Twitter + Facebook but to lower the noise level on my very active Twitter feed, I do not publish favorites to it. The customizable message is sweet as it allows me to hashtag my tweets more easily for data indexing and searching (which I now use extensively on Friendfeed). One of the most frustrating experience working with musicians and sound designers is sending large audio files back and forth. Do you put it on the FTP? Do you RapidShare? Host your own extranet? Creating custom and secured solutions are often costly, but SoundCloud made it easy with their DropBox. The DropBox enables everybody, even people who are not on SoundCloud, to share their tracks with you. The DropBox supports a versatile range of audio formats: AIFF, WAVE, FLAC, OGG, MP3 and AAC. Best of all, there is no file size limit to your uploads! The embeddable widgets is written completely in html + css, which means that you can style it anyway you want, but the minimally designed stock widgets in both white and black fits in perfectly on any graphic design you already have. All in all I have had a very good experience on SoundCloud, and I have been recommending it to all my musician + sound designer friends. While SoundCloud intends to be a tool for musicians, it is also a really great way for music lovers who wish to discover indie music not found any where else. Because of the very active community and group participation, I am grateful to have met many great artists in Brooklyn as well as people around the world who are passionate about symphonic electronca.